Olga Smirnova and Yves Hanoulle invite you to the Agile Games Night on Wednesday March 20 at Touring Assurance in Brussels. Register here if you want to attend, because the event is limited to 20 participants. 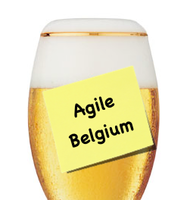 Our next Agile Belgium Drinkup (#15) will take place the 8th of August. Feel free to book your participation here (it’s free). What’s an Agile Drinkup ? This is an informal meetup of the Belgian Agile and Lean community. Come after work and meet people you usually only meet at conferences. Anyone interested in Agile or Lean can join. December 14, 2011 from 19:00 until… you decide to go home. You can find us at the back of the ground floor, the tap bar. When you are in the bar go as far as you can go at the back, you’ll find us there. It’s quieter there. The next one is a bit special as it’s the last one of 2011. It might be a good idea to retrospect on the previous editions and take decisions for 2012. So if you want to participate to the retrospective or if you just want to have a beer and talk Agile with some peers then join us! Add your name to the list to attend. Near Brussels Central station and the Grand’ Place.